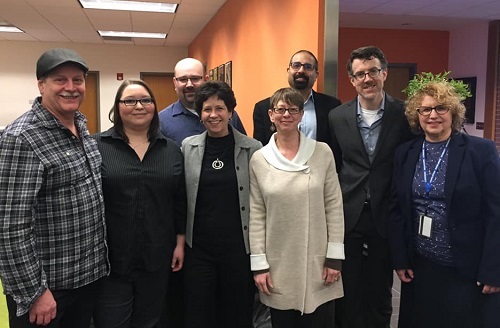 SPSCC awarded tenure to seven faculty members at the Board of Trustees meeting on March 12, 2019. In order to be awarded tenure at SPSCC, faculty members must satisfactorily perform required instructional and non-instructional work within their assigned area of discipline, such as course instruction, curriculum design, and service work over three years. During this time, their performance is under review by a Probationary Review Committee that reports to the Board of Trustees. At the end of three successful years, the Board can grant the award of tenure. Chad Bacon earned a degree in Advanced Manufacturing Technology. Kathleen Enseñat earned a B.A. at Southern Methodist University and an M.S. at the University of Houston. Michael Gray earned a B.A. from Albright College, an M.F.A. at Ohio University, and an M.A. and Ph.D. at University of Essex. Parakh Hoon earned a B.A. at Saint Stephen’s College, an M.A. at Jawaharlal Nehru University, an M.A. at Brigham Young University, and a Ph.D. at University of Florida. Lauren Love earned a B.A. and M.F.A. at University of Wisconsin and a Ph.D. at University of Minnesota. Scott McLean earned an A.A. at Culinary Institute of America. Amanda Ybarra-Rotelli earned a B.A. at The Evergreen State College and an M.A. at Humboldt State University.